God's grace has brought us into a saving relationship with Jesus as our Lord and Savior. As believers, we recognize that Jesus' sacrifice on the Cross was much more than a terrible miscarriage of justice and the murder of a good and decent man. Jesus is God's wisdom, a wisdom to convince us of his love. Jesus is our righteousness; taking our sins upon himself he made us righteous. Jesus is our ongoing holiness. His blood cleanses us at the beginning and continues to do so today. 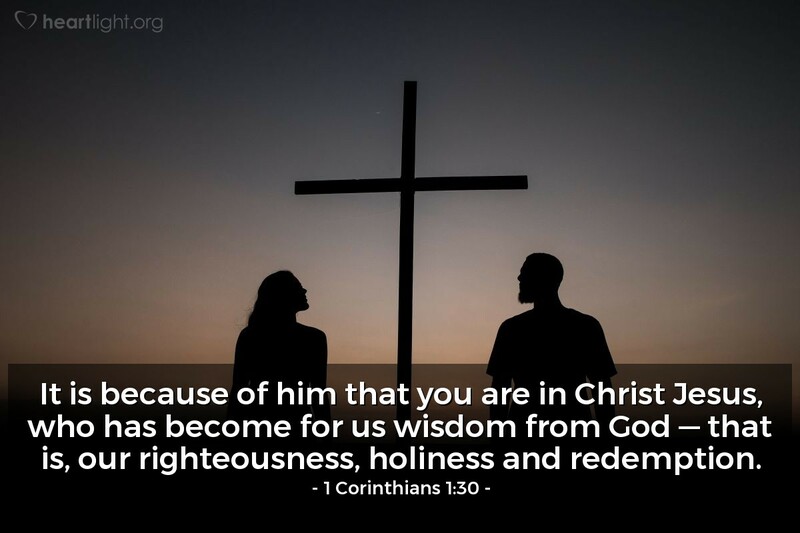 Jesus is our holiness; his death means our righteousness. Jesus is our ransom payment, redeeming us from sin and death. Jesus is our everything! Almighty and Abba God, thank you for your holiness and righteousness. Thank you for your gracious forgiveness. Mold in me a heart like your Son's heart. Make from me a more usable vessel for your Kingdom work. In Jesus' name I pray. Amen.